As dogs are primarily carnivores the answer is: meat. Not cooked meat (there are no stoves in the wild) but raw meat served complete with fur, feathers, bones, innards and all the other bits. Dogs are also partial to vegetables (a dog who will remain nameless, yes I’m talking about you Honey, digs up and then devours my carrots when she gets a chance), fruit (I used to have a cocker spaniel that picked blackberries using her mouth) and other delicacies such as eggs, insects, herbs and grasses. This is the diet that they not only prefer, but which they are biologically designed to eat. I won’t come over all scientific on you just yet (for fear that you will stop reading) but whereas a human intestine goes on for yards and yards (up to 28 feet) a dog’s intestine is never more than two and half times its length. What is the significance of this? Dogs simply can’t digest all sorts of things that humans can, including grain. I mention grain specifically because there’s a lot of it in processed dog food. One other quick scientific fact to be going on with: dogs’ teeth were made for ripping and tearing, not for chewing. That’s why dogs gulp much of their food. They don’t have the molars to break it down mechanically – instead all the serious digestive action takes place in their small intestine. Anyway, this article is all about feeding raw food to dogs. It is a summary of all the research I did before I switched my own dogs. When I first heard about the diet I was sceptical. When I understood what it was, I saw the logic but was still concerned. It was only when I really started to read about canine anatomy and metabolism that I was totally convinced. The argument for raw food is not emotional – it is based on hard evidence. Despite my O’level in biology (no one being more surprised by this modest achievement than myself) and the fact that I was involved in obedience training from the age of eight, I must confess that it was only late in life that I finally began to question all the popular myths about dogs and their insides. I now know the following to be completely and utterly untrue: article written by Jonathan SelfJonathan is one of the founders of Darling’s Real Dog Food. He is a journalist by trade. Nowadays, he writes mostly for Country Life. 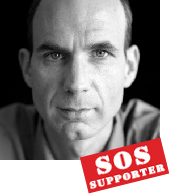 Jonathan is a trustee of the World Land Trust and lives in Ireland. We’ll come to why each of these statements is wrong it a moment. Before doing so I’d just like to explain how these beliefs became so widespread. James Spratt, an American, invented modern dog food in 1860 when he launched the first complete dog food – a biscuit made of wheat meal, vegetables and blood. Almost immediately mill owners saw its potential as a way of selling their by-products (basically floor sweepings) and low cost meat meal at a much higher price than they would otherwise achieve. From day one dog food producers made extravagant claims for their products and paid vets for endorsements. Interestingly, the basic recipe for dried dog food, manufacturers’ claims and the marketing methods have barely changed at all in 150 years. Ken-L-Ration, the first canned dog food, was launched after the First World War, when over supply led to horsemeat becoming almost worthless. Demand grew and by the end of the 1960s all but a tiny percentage of dogs came to be fed on manufactured dog food. Perhaps this isn’t surprising when one thinks how consumers moved from old-fashioned cooking to modern convenience foods. The real point is that the dog food industry has got more and more valuable. In the UK alone it is worth over £1 billion a year. If you look in any major supermarket you are likely to find a remarkably high percentage of the shelf space devoted to the stuff. Dog food manufacturers also account for some of the biggest advertising spends in the country – especially on television. It isn’t just the overall size of the market that makes it so attractive to manufacturers. Processed dog food is incredibly profitable. This is because the law as it relates to ‘animal feed’ is much less stringent than the law as it relates to food for human consumption. In particular, manufacturers can use ingredients deemed unfit for human consumption: meat that is long past its sell by date, animal by-products (heads, feet, viscera and other animal parts you may prefer not to think about) and also animal derivatives (heart, lung, muscle meat and so forth that has been rendered down into a sort of gunk and then turned into a dried additive). 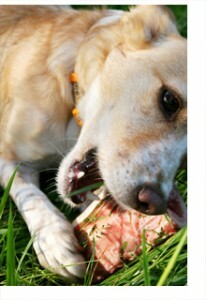 Before processed food existed owners fed their dogs raw meat, bones and leftovers. Over the course of a century and half manufacturers have persuaded us all that there was a better and more convenient option. Part of this process has been creating the myths I mention above. For if you look at each one again you will see that they support the idea that a natural, raw food diet is bad and that a cooked, processed food diet is good. You might think from what I have just said that it is the quality of the ingredients that prejudices me against processed dog food. Well, it is a major issue but there are other problems to consider. Processed food has been cooked. Paleontologists (I am quoting here from a book called Dogs, Diet and Disease, which you’ll find reviewed elsewhere on this site) estimate that a period of approximately 100,000 years is required before evolutionary changes occur within a whole species. The most accepted theories estimate that dogs began their association with humans between 10,000 and 15,000 years ago. They haven’t, therefore, had time to adapt to eating cooked food let alone the other ingredients in processed food. Another point. Whereas human saliva contains lots of enzymes that aid digestion, canine saliva doesn’t. Instead dogs have the short digestive tracts described above and very strong stomach acids. When food is cooked it alters its chemical structure, destroying much of its nutritional value and killing enzymes that dogs need to digest. A processed food diet – because it is cooked – forces the pancreas to work harder and to draw other enzymes from the blood stream. This can leave a dog physically vulnerable because the enzymes in the blood are supposed to be protecting the body, not aiding digestion. A number of medical studies show that the pancreas enlarges on a diet of processed food. An enlarged organ means excessive function. Excessive function can lead to degeneration. It is a similar story when it comes to amino acids. Cooking at high temperatures alters the arrangement of these acids making half of them unusable by the canine body. The best way to describe the effect of cooking food for dogs is this. In the wild a dog will digest its food in 4 or 5 hours. Processed food, on the other hand, can take 8 to 15 hours to break down, clear the stomach and pass through the small intestine. It is not just the cooking that makes processed food a problem for dogs. There are the other ingredients to consider. Take the fibre that gets added. In most cases this takes the form of peanut hulls, almond shells, empty grain hulls, beet pulp and so forth. None of these things offer any nutritional value to dogs. Then there are the chemicals. Chemicals to preserve it. Chemicals to alter the smell. Chemicals to change the colour. Chemicals to bind it so that it looks like chunks of meat or little dried shapes. And the fats. These are usually of poor quality and could be recycled from deep fryers in restaurants, tallow that rises from rendering plants, rancid fat so on and so forth. Many commercial dog foods have fat sprayed on them as a way of making them palatable to dogs. Not forgetting the grain element. There is a reason why one rarely sees a dog stalking a wheat or rice field. Dogs find it tricky to process complex carbohydrates (grains). They can’t store them like humans can because the complex carbohydrates just end up in an accumulation of lactic acids. A certain amount of grain can be tolerated, of course. But too much (and some food can have up to 65% grain although it may not show on the label because it will have been divided up into lots of different ingredients), generally speaking, is an inappropriate source of protein for a carnivore. Plus, of course, manufacturers must replace all the nutrients and vitamins destroyed by cooking with artificial substitutes. To be candid I haven’t even begun to touch on all the different things that are wrong with processed food. If you are interested in going into it in greater detail then you’ll find three books (written by professionals with more than an O’level to their name) that deal with this at length mentioned in my son Nat’s article. The easiest to read is probably Ian Billinghurst’s Give Your Dog a Bone, but Tom Lonsdale’s Raw Meaty Bones and Caroline Levin’s Dogs, Diet and Disease are probably more comprehensive. Yes, yes, but does it actually matter? OK, you may be saying to yourself at this point, so processed food uses (by and large) rather inferior ingredients and is a bit of a nuisance for my dog to digest but does it really matter? The fact that processed food is bad for teeth and gums and leads to all sorts of other health issues is discussed in my colleague Vicky’s article: Give a dog a bone so I will say nothing more on the subject here. A growing number of vets and nutritionists believe that many if not most of the medical conditions that dogs are being treated for nowadays are a direct result of their diet. We are talking about everything from relatively minor problems such as bad breath, flatulence, itchiness, allergies and dry skin through to major problems such as cancer, liver disease, heart disease and kidney disease. If one cares about dogs it is very easy to get worked up about the processed dog food industry. It is a scandal waiting to happen. The only difference between this situation and what happened with tobacco, asbestos, powdered milk formula, fast food and all the other consumer campaigns that have led to major changes is that the victims of the processed dog food industry can’t speak for themselves. Right. Let me move away from a subject that pushes my blood pressure up to one that brings it down: raw food and why it so incredibly beneficial to dogs. The key point – one that is irrefutable – is that all species should eat what they are biologically designed to eat. In other words, what they would eat in the wild or as close to what they would eat as is feasible. Dogs are carnivores. In the wild their primary diet is prey. This could be small animals – mice, voles, rabbits, birds and so forth – or it could be larger prey caught with the help of a pack. Either way, they eat everything – the internal organs, the meat, the bones…the lot. Dogs aren’t only carnivores, however. They are vegetarians. Wild dogs scavenge for rotten fruit and will also eat the semi-digested contents of their prey’s stomach. Some will also dig up vegetables and will eat grasses and herbs. Something else. They are scavengers. They eat the left-overs from every animal that is killed or dies. They receive, and here I am quoting from Billinghurst again, ‘valuable nutrients from materials that we humans find totally repugnant. Things like vomit, faeces and decaying flesh.’ With regard to the faeces, incidentally, these contain the dead and living bodies of millions of millions upon billions of bacteria. They are an excellent source of protein, essential fatty acids, fat soluble vitamins, minerals, anti-oxidants, enzymes and fibre. Not wanting to dwell on an unpleasant subject but if you have a dog that is on a processed food diet he or she may be eating faeces in order to stay healthy. 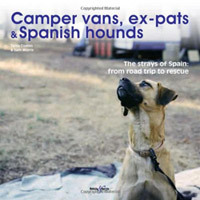 There are two other facts about dogs living in the wild that we must consider. First of all, they don’t necessarily eat every day. This will depend on where they are located and what food is available. Secondly, and perhaps more importantly, they don’t eat balanced or complete meals containing everything they need in the right proportions. This is a very human piece of thinking. What dogs do is get all the nutrition they need over a period of time – eating it as they find it or seeking it out, if their body is telling them they need it. This is referred to as the ‘balance over time’ concept. It is crucial to the way dogs should be fed because there is evidence (see Billingshurt again) that dogs fed all the ingredients they need in proportion at every meal do suffer increased health problems. My colleagues and I believe ‘balance over time’ is a crucial part of sound canine nutrition and we are in the process of developing a system to ensure that the dogs we are responsible for are fed in the optimum way. Food has two core functions. It provides energy and it helps the body to remain healthy. With regard to energy the amount required will depend on a variety of circumstances including how old the dog is (growing dogs need more, elderly dogs less), the amount of exercise being taken, whether the dog is pregnant or feeding and the temperature (weirdly, dogs in really hot climates can need more energy as panting uses up more calories than you might imagine). Interestingly, dogs do not need a lot of carbohydrates or simple sugars for energy (although a small amount can provide useful fibre) as they can’t digest it. Their core dietary requirements are fat (it provides energy and protection and it enables the body to absorb fat-soluble vitamins), essential fatty acids (Omega 6 and Omega 3); protein (with essential amino acids) and a wide range of minerals and vitamins. What a dog needs for energy is obtainable in its natural diet. All processed dog food companies are trying to do is replace what dogs ought to be eating with inexpensive, inadequate, adulterated and inappropriate ingredients. Clearly, feeding domestic dogs a wild diet would be quite challenging. Animal and bird carcasses, complete with fur and feather, are a health risk, smelly and unpleasant to look at. However, it is possible to replicate a wild diet using tame ingredients. And providing they are fresh. Forget that I am writing this as the founder of a raw dog food business. Let me tell you what your dog needs to stay healthy. From animals and fish your dog needs raw meaty bones, lean muscle meat and internal organs from chicken, lamb, beef, rabbit and pork; eggs; cheese, cottage cheese, yoghurt, milk and butter; and fatty fish such as herring, salmon and sardines. From plants your dog needs green leafy vegetables (spinach, cauliflower, broccoli etc. ), root vetegables (carrots, turnips, parsnips etc. ), fresh and dried fruits (but not grapes), brewers yeast, kelp and molasses. Plus your dog could do with a little bit of cod liver, safflower, hemp or sunflower oil. Of course, you must get the proportions right. Too much lamb or rabbit, for instance, can lead to problems and there are issues with some vegetables, such as potatoes. But, basically, if you want to feed your dog raw food then the above list pretty much covers it. Many people report that for psychological – not practical – reasons switching their dog from a processed food to a raw food diet took some time. 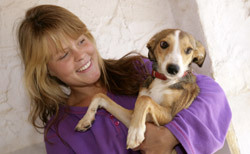 It is hard to get it out of one’s mind that – say – dogs don’t need ‘meal’ or ‘kibble’ as part of their diet. 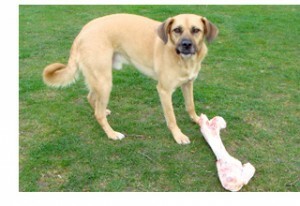 Giving a dog a raw meaty bone can seem (the first time) almost risky. Whether or not you decide to become a customer I would urge you to consider switching your dog across. We are happy to answer questions and point you in the right direction even if you aren’t a customer.